Manipuri dance is another classical dance that originated from Manipur state of India. The dance is in the form of dance drama based on Raslila (the love between Radha Lord Krishna). The main theme of this dance is Vaishanivism. The other form of dances in Manipuri includes Pung Cholom, Nupa Cholom, Toibi. Among all these Raslila is the most prominent dance form. These dances are a medium for worshipping and also for social gathering for the people. Lai Haroba is a dance festival that is associated with Meitie People (majority of ethnic people in Manipur) to please the deities with Lord Natraja postures. The dance has its roots from Natya Shastra a ancient text on performing arts. It was written by Bharata Muni. The text consists of 6000 verses and 36 chapters. During the medieval period Maharaja Bhajyachandra of Manipur adopted Lord Krishna based songs to reform Manipuri dance. It is called as Gaudiya Vaishnavism. He codified the Manipuri dancing pattern that helped in the revival of the dance. Among the five Ras lila three were composed by him that are Maha Ras, Basanta Ras and Kunja Ras. He also designed costume for the revival. The costume included mirror studded stiff skirt called as Kumil. The dancer playing Lord Krishna character expresses emotions through different body language, and postures while the gopikas expresses the feelings of dejection or even sometimes happiness through different dance posture. Manipuri dance is a group dance with light sensual movements from women. The dance is very gracefully done with light lyrical music. Chali is the basic dance movement of Manipuri dance. The dance is performed in three forms Tal Rasak, Danda Raska and Mandal Rasak. This dance is performed three times in a year. During spring season from March to April, then autumn from August –November and during Holi festival. All the three times it is performed on a full moon night. The main theme of the dance is the love between Radha and Lord Krishna with accompanying Gopikas namely Lalitha, Vishakha, Chitra, Sudevi, Rangadevi and Indurekha. The longest and the lengthiest play focus on Lord Krishna and Radha. 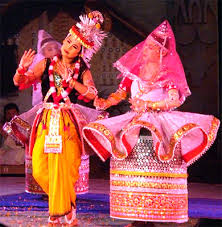 Manipuri dance has a wonderful costume especially of women. The women dancers are dressed like bride known as Potloi costume. Kumil is the embroidered long skirt in the shape of a barrel with stiffened bottom along with Velvet blouse. Kumil is designed in the upper with flower shape and tied at three different places on the waist. The male dancers wear dhoti pleated and tied to the waist along with peacock feathers to resemble lord Krishna. The dancers do not wear bells for ankles or ghungroos. They wear jewellery all around the body and with heavy makeup on their face. Usually the female dancers cover their face with a light dupatta. The musical instruments include Pung (a barrel drum), flute, Violin. The drummers are male singers and the lyrics of the songs are usually in the language of Sanskrit, Mithali and Brij Bhasha and the poetry includes Jayadeva, Vidyapati, Chandidas and Govindas. 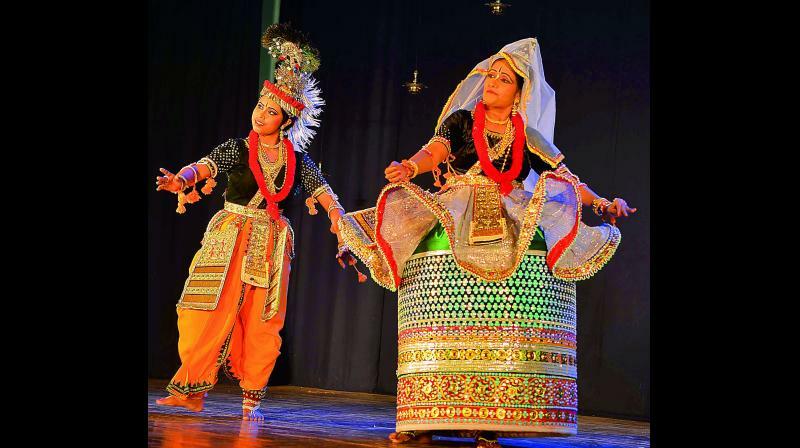 Some famous Manipuri dancers include Guru Bipin Singha, Charu Mathur and many more.